Day 2 of 3 on paternal cousins skirt week. (Can you call them paternal cousins?). The youngest of the three sisters is starting pre-school this year. She's an absolute doll, and needed a new skirt all her own. I've had this apple print corduroy scrap, sitting in my drawer, just waiting to be used. 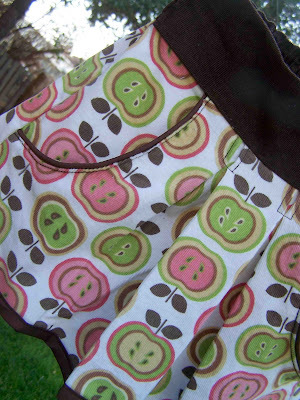 I thought this was a fitting print for back-to-school, and the corduroy adds a bit more warmth than a cotton. I'd intended on having about 2.5 inches more on the length of the skirt, but as I serged my last seam, I somehow managed to catch the under layer in the knife and make a nice ugly hole in the skirt. I think that the skirt will still work, but it made the proportion of the pockets a bit odd. I tried the skirt on Clark (my husband hates that), and the skirt should still be about knee length, perfect with a pair of leggings. 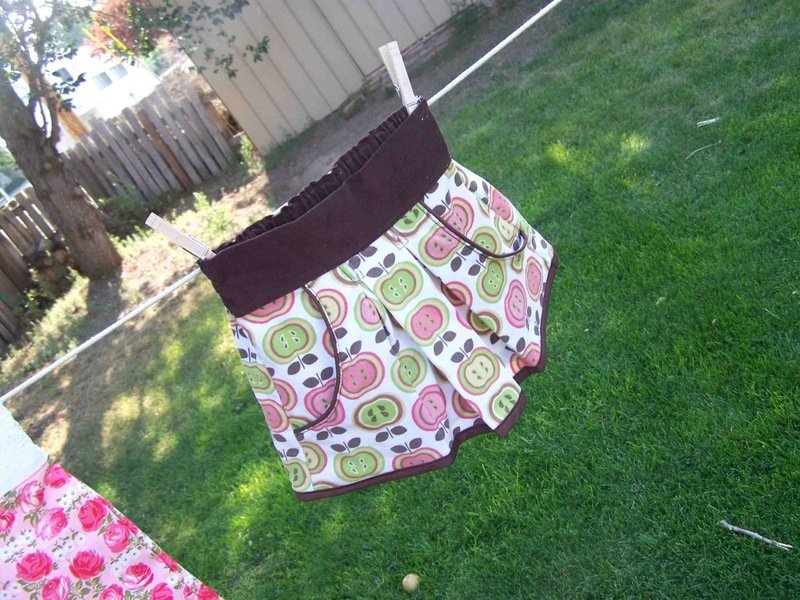 The skirt features two box pleats, a contrast waistband, and some piped side pockets. In an effort to save every bit of length I could, I trimmed the hem with bias tape. 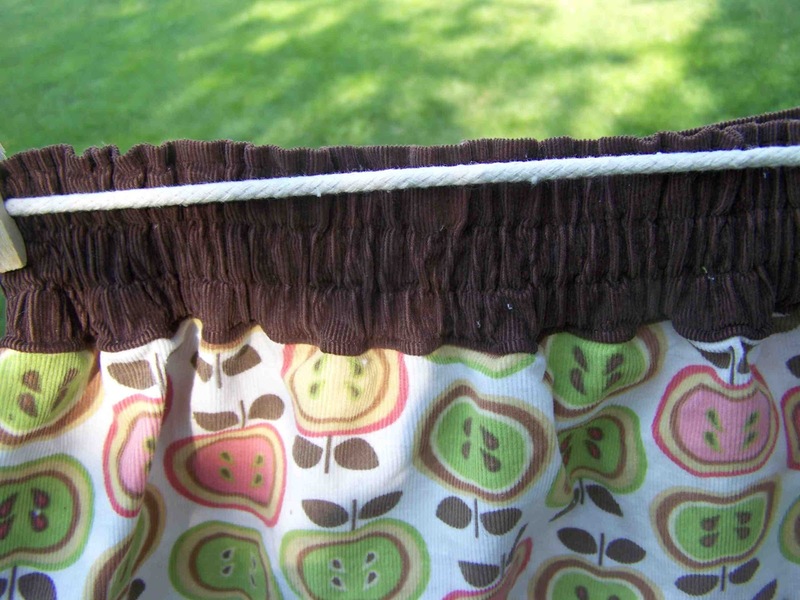 Much like the June Bug Skirt, I sewed three bands of elastic onto the back of the waistband, leaving the front flat, and eliminating any need to run to the store for supplies. I thought that the skirt turned out pretty cute, not perfect, but wearable. Luckily, my niece could wear a paper bag and make it work. 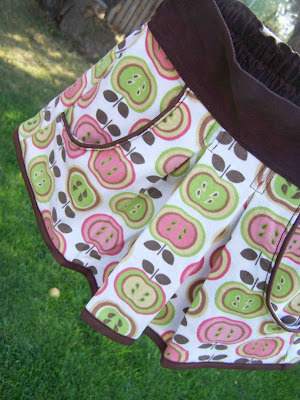 It's a bit of a hybrid of the piped pocket infant skirt, and the boxed pleat baby skirt.